The tranquil Tarsier monkey calmly reflects on the year 2018. Merry Christmas! I hope you are enjoying the holiday season wherever you are in the world. I created this post after first seeing the 20 end-of-year questionnaire up on the @dailypsych page on Instagram. I then decided to participate and write my own answers to the questions on the page, along with a recorded audio version and turn it into this blog post. I hope you enjoy this post and consider writing your own review for the year. 1. What was a new discovery you made this year? What did you discover that you loved? - This year I explored, hiked and camped in both Argentina’s and Chile’s Patagonia. I discovered that I absolutely loved the experience, including carrying all of my things on my back, sketching and painting the landscape where I could no matter how much I was shivering and shaking from the cold, and camping in my own tent under the stars. I now rate travelling Patagonia as one of the best things I have done in over 9 years of on/off travelling. I also saw the planets Saturn, Mars and the Moon through a telescope at San Pedro De Atacama Desert, Chile in November. These experiences I think will stay with me forever. 2. What was one of the biggest pleasant surprises you experienced during the year? - Discovering Ice glaciers, dense forests, panoramas of mountainous landscapes and looking at all the major sites on my travel experience in South America without first looking at photos from other sources. This has enabled me to experience a true element of surprise during travelling much more often this year. 3. What achievement are you most proud of from this year? - This one isn’t easy to answer. I would have to say that keeping a good level of consistent discipline and sticking to my original goals as closely as I could manage over 10 months of travelling in Latin America is definitely something to be proud of. I produced a number of original drawings and paintings, all related to the places I was exploring and travelling to. And I also completed a number of large-scale murals in Brazil, Chile and Uruguay. I am proud because I created these opportunities through my own deliberate effort, organization, planning and will. All of these aspects have been areas I have wanted to strengthen in my creative and productive arsenal for a long time. I also stood up for the first time and practiced public speaking at a highly emotional and significant event. I always looked at public speaking as something I was afraid of, but I knew I had to step up and take on this new challenge earlier this year. Now I know I can do it and have more confidence than before. I was able to make the room laugh and relate to my story. I had many individual people come up to me privately, thanking me for what I said after I spoke. 4. What was your favourite purchase of the year and why? - My favourite purchase this year so far was probably my small, $5 table tripod, which I can use to record HD video with my phone. This will allow me to film my drawing and painting progress and experiment with video production. I was also very happy with a small, pocket size watercolour sketchbook which I can take anywhere with me for quick painting studies. 5. What was a new habit or routine you created this year that has improved your efficiency at home or work? I think that making sure I would dedicate 1-2 hours in the morning to deliberate art practice has really helped me maintain momentum and productivity on this trip in Latin America so far. I know now for sure that the first few hours after I wake up are my most productive and focused, and also later on in the evening. I know I need to dedicate the first 1-2 hours to my own creative goals first before doing other work. This is because I have found that I feel much better working on my own goals first, and by doing so, also seems to give an additional energetic boost of enthusiasm towards other work related activities that needs to be done. 6. What did you face head on this year rather than avoiding, such as you dealt with credit card debt or a difficult conversation? I think overall, this year I have faced fear and doubt on many occasions. I stepped up to be the one to speak publically when nobody else wanted to. I have also been travelling alone through South America, in unsafe areas. 7. What did I ask for help with this year where I’m glad I did? I asked a friend to help me come up with creative ideas for improving my Instagram page and website. I’m glad I did this and continue to do so because I am able to get a different and more informed perspective in what I am currently doing and areas where I can improve on which I might not have seen or considered myself. 8. What relationship was the biggest positive surprise to me this year? This is a difficult question to answer because I have had many instances where new and old friends and family have been a positive surprise to me this year. But I think I will focus on my family for this one. Firstly I have to give both of my two sisters Charlotte and Ellie credit, both have shown courage and resilience this year, along with the beginning of a shift into a positively thinking and empowering mindset, both taking action in their own ways, leading to their own personal growth which I admire. I also have to give credit to my Mum who has started to get a better grip on her own environment after some tragedy and loss this year. Also to my cousin Jack, who has continued to research and study on his path to finding truth, and how has also shown courage and strength in the decisions and actions he has made, and now planning ahead for his future. 9. Who do I need to thank for their role in my life this year? I think I have to give thanks to my friend Ron Wallace, who has consistently had my back and has offered positive guidance, support, encouragement and wisdom on my travels this year. I have to thank Ron for the consistency of empowering messages he has sent me throughout the year, not to mention Ron has been a true supporting friend of mine. At times when I needed to laugh, relax more, rethink and re-analyse, Ron has been there for me at least in spirit as a positive guiding force on my path as I’ve travelled South America. Thank you Ron. 10. What's an aspect of self-regulation you've gotten better at this year? This year I have made sure I have kept a level of discipline as I’ve travelled. I knew from past experience that it would be hard for me to keep practicing and developing my art during travel, and I made sure to first plan and make the intention to achieve a certain amount of study and practice per week to aim at, and I think overall I’ve done a pretty good job at it. I have made sure to record the time I’ve spent working on my art using an app and having a weekly report sent to my email address. I have also made sure to keep social media use down to a minimum level each day during the week. 11. What's a goal you gave up on this year, and you're glad you did that because objectively it wasn't your highest priority? I don’t think I have really given up any of my goals and completely abandoning any of them, but I have come to the realisaton that being able to travel all or most of Latin America in 12 months at the pace I have been travelling at has not been realistic. My focus on art production and study as my main priority has meant that I’ve obviously had to travel at my own pace, and not at the usual high tempo that most travellers move and experience with. 12. What's a skill you have gained confidence with this year? I think my ability to communicate much more clearly, concisely and confidently has improved. I now feel like I can more confidently speak to an audience or group of people, and I am becoming more confident at recording my own audio and speaking to an audience as with this recording for my blog and website. I have also increased my level of confidence with my ability to draw and paint murals to any scale. I would also say my general level of negotiation and assertiveness has improved. 13. What simple pleasures have you especially enjoyed this year? I think the general sense of freedom throughout the year has been the most enjoyable. I have been able to travel freely and stay in places mostly for as long as I’ve wanted. I have also had the freedom to focus on my own development and growth. I have enjoyed the freedom to work my own hours when I have had a job to do, and create my own schedule, essentially being my own boss. 14. What was a goal for the year that you followed through on, or partially followed through on? To travel to South America and not only enjoy the travel experience, but to also focus and concentrate myself on artistic activity, study with my online school and development as I’ve travelled. I have stayed true to this main goal of mine. 15. What's a type of technology you've integrated into your life this year and it's working out well for you? I have been using an app called ‘Forest’ when I am not using my phone to listen to music. This app allows me to grow digital trees and potentially a digital forest for the time I have set up to focus on a particular task or productive work, and have followed through with it’s completion until the timer I set up has complete. This probably sounds a bit silly, but you have an incentive to continue with your focused work and resist the temptation to open your phone up for whatever reason, and not only that, but if you quit the timer, your potential digital tree dies, which you probably would prefer not to happen and be reminded of when you check your digital landscape. Later you can look back at the forest you have created as a result of your productive, focused work, which works as a visual reminder of what you have achieved on that particular day. This app has helped with my productivity lately this year. I have also made a start using Google Calender, but I need to better integrate it into my life in 2019. 16. What did you change your mind about this year? When I returned back to England in April, I considered staying in Brighton my hometown for a longer period of time, potentially for a few more months. But I changed my mind at the last minute and decided to take my return flight back to Brazil to continue travelling. 17. What did you try that didn't work out, but the process of trying it moved your thinking forward in a helpful way? I tried to run my first art giveaway. I didn’t expect too much of a response at this stage, and I knew that many wouldn’t see the post, but in the end it didn’t work out as my requests weren’t met by my audience. It has helped me think about creative ways about getting my artwork seen by more people, and it is something I will try again and experiment with in the future. There was some response and interest, but nothing materialised from it. 18. How did your self-perception change this year? In what ways have you started to see yourself more positively than you did previously? I reinforced trust in myself that I can face my fears and grow from constantly challenging myself. I have invested more time into my art this year and have achieved more artistically which I am proud of, and my self-belief as an artist has increased. I am now planning ahead and thinking about what I can do to help advance my art career. 19. What's a thinking bias you've become aware of this year? I have become much more aware of what is calledthe ‘Bandwagon Effect’. This refers to a group-think and herd like mentality of the acceptance and belief in certain things, and actions taken, simply because it is what the majority believes and does. 20. How has what you enjoy shifted this year? I would say that my enjoyment for creating art has shifted into a more professional state. Not only in the quality of my work, but also my attitude towards my work, my working habits, and forward movement towards making the thing I love to do, my vocation, into my full time job and occupation. I think people usually associate somebody travelling or backpacking across a country, a continent or around the world, as someone who is on an extended vacation, or on a long holiday, which doesn’t involve much work if any at all. Of course that is the case for some travellers, especially if they have commitments to return to such as with work or study. But there are travellers out there, such as myself, who have committed themselves to study, work and development as they travel over much longer periods of time. . Discipline. Many people claim to dislike the word, probably because it serves as an unwelcome reminder that proper application of will power, hard work, focus and effort is required to kick-start and maintain any intention, and goal to strive towards. But what if the goal or intention is aligned with something vocational instead of occupational? What if the thing to work towards is something first of personal benefit? What happens when the very thing the individual is working towards has personal meaning behind it? It seems to me that an added wave of motivation and enthusiasm is more frequently available to those aligned with something vocational. That is, a subject, topic or activity that one has freely chosen to pursue. And with vocational ‘work’, the line between work and play easily becomes blurred. The process is far more enjoyable, of course because it is something we want to do, and the ability to sit down and be productive with the activity, along with the intention to practice and improve is not as daunting. Discipline then should be easier with a chosen vocation. The apparent burden to work hard becomes lighter during the activity. But if the work you have to do on your trip is not exactly something you feel enthusiastic and excited to take on, you can still reap the benefits of keeping a little structure and focused activity in your schedule. The process of being able to be productive and focused when travelling requires a level of discipline which can be refined and worked on every day, in small incremental steps, just like working a muscle. It’s definitely not an easy task if you’re starting from a place of having zero level of discipline, it can be a huge struggle when there no positive habits are already in place, and especially when you have a plethora of invites to do all kinds of activities that come along with staying in hostels, and the excitement of being in a new place and wanting to explore as much of it as possible, as soon as possible. Not to mention the difficulty and vulnerability of being in a position where you are not yet established in your chosen field, and consider yourself having a very long way to go before you get close to the role models you look up to, and whatever ambitious heights you wish to scale. But that doesn’t mean the struggle has to be something you despise, seek to avoid, or refuse to undertake. You can embrace the struggle, and accept the fact that you are pushing yourself to grow and improve, which will inevitably lead to greater personal growth. Remind yourself in difficult times that your chosen act of vocation is something you have generated a deep inner admiration and love for, which should enable you to actually really enjoy the process. You have to stay centred and grounded, keeping as much focus as you can, but also making the most out of the entire experience. Staying centred and grounded involves being organised, taking proper care of your physical, mental and emotional health, eating a healthy diet, resting properly, and fuelling yourself adequately. A healthy diet should not only consist of fruits and vegetables to eat, but also of right ways of thinking, spending time with positive, inspiring, enthusiastic and hard working individuals, reading, listening and watching educational and uplifting material are other examples of a more holistic mind/body/spirit healthy diet. Travel life experience is immense, exciting and euphoric at times. But it can also be lonely, testing, frustrating and exhausting. Before, during and after the work, wherever you are around the world, doing your best to stay healthy centred and true to your goals is essential. It can be done. ‘True To His Path’ My Ink Illustration of my warrior character which I created travelling around Patagonia. We should always have a little time to pause and reflect on what has been, on where we are and where we are going. I am still working on improving my own level of discipline and work ethic as a travelling artist, and I’ve had to learn a lot by falling, failing, and not always meeting my own goals and personal deadlines. But I’ve definitely improved a lot, especially with organisation, which I once considered a personal weakness. But we have to be careful not to beat ourselves up or be too harsh on our progress which can slow down development reduce enjoyment. Patience and persistence are very important here. I still have the intention of becoming much better at all of the jobs, wearing all the hats that come with being an independent freelance artist. There’s always so much more to learn as with anything worthwhile. But I have learned a few things that might be of help to the traveller who has also chosen to stay focused and productive on their trip to some far away land. It can be very difficult to maintain focus and productivity when travelling, especially when staying in mixed dormitory rooms in hostels and always sharing your sleeping space with strangers. There is a high chance your sleep will be disturbed by someone in the room at least every other day, vs. staying in the comfort of the familiar, secure surroundings at home and your own private space. Sometimes you would like to go to sleep early but you can't, and you have to constantly adapt to the change of environment and situation. Your usual routine will likely need constant adaptation and evaluation. Your positive habits might need slight re-adjusting on a day-to-day basis. Sometimes you won't be able to find a suitable working space. You might even wake up to find that something of yours has been stolen, which is what happened to me recently. The list of things that can potentially knock you off center, and contribute to change of mood, loss of focus, enjoyment, productivity and ability when travelling are endless. But we always have the choice of responding well and with a positive mental attitude. We can always take a break, go for a walk, and do whatever it takes to relax our mind and create better wellbeing within us. When travelling, we have the flexibility that comes with the freedom, and precious time is on our side, if we can first acknowledge it, and then use it. My ink sketch of my warrior character which I started drawing on the bus from Argentina to Chile through the Andes. Inspired by my view outside my window. Fueled by my desire to work on my art even on a bumpy bus ride through the mountains. 1. Make a written statement about your main goals and then verbalise them. Tell some of the people you meet about some of your goals without revealing all the details. This will help to reinforce in your mind what you have set our to do and will do. And it will also help people around you to understand when you need space. 2. Work out how many work/study hours per week is your minimum target and do your best to stick to it by keeping to a schedule. Make a rough plan and set targets. Not too high and not too low. You want to do good work, feel a sense of accomplishment, and enjoy yourself after your efforts. 3. Work out when the best time is for you to work. Are you most productive in the day or at night? Personally the first 2-3 hours in the morning for me are best. Followed by another round in the evening. Then go and find a place where you can use the Wi-Fi, plug in and tune everything else out. When people see you with headphones in, they usually won't disturb you. 4. When you wake up, don't reach for your phone, instead spend a few minutes visualising how you would like your day to go. Practice gratitude. Meditate. Drink a glass of water and start to move your body. 5. Turn off and tune out all distractions when working. That includes your phone. Research shows that focus suffers when we respond to the alerts on our phone all the time. Keep it on airplane mode when focusing. 6. Write down what you want and need to do the next day, the night before. This will help prepare you mentally for the next day. 7. If you're an artist, start the sketch, or prepare a little for the art you want to work on the night before. 8. Turn your bus journeys into educational trips. Download podcasts in advance. Charge your device to read electronically if you don't have a physical book. And practice writing digitally. 9. If you can, be the first to go to bed in your dorm room. By doing so you have a better chance of getting the sleep you need. Going to bed late only to be woken by the multiple alarms of other travellers a few hours after going to bed isn't fun. 10. Put your headphones in when you need to focus and don't want to be disturbed, even if you don't want to listen to anything. Or choose specific kinds of music or background sounds, which can help aid focus. 11. Find a quiet space in the Hostel away from most distractions early on which you can temporarily claim as yours. 12. Take extra care of your things. Don't make it easy for potential thieves, especially in low cost hostels where chances of robbery are higher. Stash your quality things away and out of site, preferably in a locker. 13. Be mindful of where you put things. Constantly living in and out of your bag can be frustrating if you don't organise yourself and pay attention to where you put everything. Talk about your travel experience and what you’re up to today after you properly organise yourself. And don’t be afraid to tell the other person in the room you need a few minutes to yourself to get organised. 14. Write short, to do lists daily. Just to get things out of your head and on paper so you can see them. Try to stick to the main tasks you want to achieve in that day instead of writing pages of minor things, all of which can’t be done in a single day. 15. Track your time. Use an app to track all of your work time so you can keep check of your progress. I like to use an app which sends me an email report at the end of the week, showing me the times I spent on each activity. 16. Reward yourself after hard work and targets reached. You can reward yourself with a book, a film, a walk, something nice to eat, or a night out socialising. 17. Don't beat yourself up for missing the mark. Accept the situation and be fine with it, just aim to try harder on other days. 18. Make sure to have enough time to properly relax and enjoy yourself whether alone or with others. 19. Be selective with the people you converse with. You could spend all day starting the same conversations with everyone in the Hostel, which can eat up all the hours in your day. This is no good if you need to be focused and productive for a certain amount of hours. If you have things to do and need to be alone, say so, be polite and excuse yourself. You can always chat and enjoy social downtime later. People won't assume you are working in a hostel communal area unless you say so. 20. Exercise in the morning. Starting the day by moving your body, activating your energy and feeling good about yourself benefits learning and productivity in many ways. I find that I get second and third waves of energy later on in the day and into the evening if I have exercised in the morning. 21. Eat as healthy as you can. Invest in fresh, organic produce if you can, it will fuel your mind and body and is an investment on your health. 22. Listen to and read inspiring and motivational content often to help reaffirm positive thinking. You might end up in an environment where most people are on a downer, you don't want to be pulled into that headspace and energy for no reason which can impact your work and productivity negatively. Change your environment if necessary. 23. Read. Keep learning about whatever interests you. Daily reading will help you focus for longer periods of time on your work. 24. Write often. Writing, reading and speaking help to organise your thinking and thought processes. 25. Limit alcohol intake. Alcohol kills motivation, inspiration, focus and creativity. Moderation is key. 26. Take regular breaks to give your brain a boost. Walk outside and around the block. Take a short power nap or siesta, whatever works best for you. 27. Get out into nature every day (if you can). Nature will help you to recharge, relax and de-clutter your mind. It will also bring you back into present moment awareness. 28. Record inspiring thoughts and ideas with notes and voice recordings as soon as possible when a pen and paper is not immediately available. By doing this you can refer back to them later when you're not over busy. This can be very useful. 29. Practice gratitude, every day. No matter what your situation is, there is always something to be grateful for. Reminding yourself to be grateful helps you to put things in perspective and encourages positive, healthy and correct thinking. 30. Keep a pocket notebook or sketchbook with you everyday, which you can pull, out anywhere and record your thoughts, inspiration, or practice drawing. 31. Download pdf, kindle or eBook versions of whatever it is you want to read/study to your phone. That way you can learn on the go while on a bus or while waiting for long periods in line. (Brazilian supermarkets for example). 32. Have at least 1 day off, or the entire weekend. We produce our best work when rested properly and relaxed, there is no point pushing yourself towards stress and burn out. You deserve a day off no matter what. 33. Back up all your files and content to cloud storage daily. This is something I've been doing lately. It helps put your mind at ease when you know all of your oprecious files and photos are stored away on the cloud. As a friend recently put it to me, think of It as ‘travel insurance’ for your work and memories. Don’t rely only on backing up to a physical pen drive or hard drive. One of my recent plein air (outdoor) paintings in El Chaltén, Patagonia, Argentina. It was freezing cold, and it had started to rain, but I was determined to get a quick study down. Make the most of all your time when travelling whether with work, rest or adventure/experience/play. Try to be 100% present with whatever it is you are doing. By doing so you will feel much better about yourself and you will grow more self respect and self love as you progress and make small achievements along the way. And that individual need must come first before it can be given and expressed outwards to others. By training your mind and body to embrace such a worth ethic, you will surely progress as you travel, and you might just serve as inspiration for someone who would like to emulate such a way of living. Less than one day ago I came back from the BTC Graffiti Festival in Candeais, Bahia, Brazil. I was lucky enough to be invited last minute, as an international artist and participate in painting at the event. I had never heard of the event before, and only discovered its existence and the fact that I was going to be attending, around 9pm the night before the first day. The whole 4 days went by really fast, and I had about 1 hour spare to try and prepare, sketch ideas and plan ahead. Actually it was more like 45 minutes. I usually like to plan a piece of art that I intend to finish to a high standard. Sometimes I will write ideas down on paper first, or brainstorm. But most of the time I dive straight into the thumbnail sketching stage where I draw out a number of small boxes in my sketchbook, literally around the size of thumb or thumbnail (sometimes a little bit bigger), and sketch abstract ideas and concepts down rapidly. The point of this exercise is to get as many ideas down as possible in the shortest amount of time, neglecting any thoughts or inclinations to draw out any level of detail. Just plain lines and abstract shapes, sometimes with a little value shading to give a sense of scale or depth, but even the value sketches can be done in a matter of seconds. And these sketches don’t need to make sense to anyone else, so long as you know what the lines represent, and the initial idea you had, with the sketch serving as a reminder, you are good to go. Usually after having completed a range of thumbnails, I would take up to 3 of my favourite, and develop them a little further at a slightly larger scale, using pencil, and begin to work out some of the possibilities and details. After this stage, I would experiment and explore some colour concepts and variations by photographing/scanning my sketches, and painting over them digitally using Adobe Photoshop. This time however, with my matter of minutes to come up with an idea and sketch it out, I had to put my main focus on the thumbnails. Initially I wanted to create a mural of something I had already created, as I was going to do a full scale spray paint mural outside in the public view, (my first) and with the little time I had I wanted to ease this transition and allow a little comfort and confidence with knowing exactly what I would paint. But instead I decided to go for something original. The black Jaguar/Leopard is one of the animals that have appeared in my dreams in the past, a few times in fact. In the dreams the Jaguars are around me, just quietly sitting by me, watching, resting, being quiet and still, or walking by/around me. As I am in Brazil, it made sense for me to paint something related to the country, and environment. So I decided to paint this wild cat from the South/Central American Amazon. The theme was also ‘Illumination’, or light. I was conscious about the theme as I progressed with my mural, and made decisions to try and express light & colour in the natural scene. After trekking through some jungle terrain, and swimming under the biggest waterfalls I have ever seen in my life at Chapada Diamantina National Park, gathering it all together along with the inspiration from my own personal dreams in my mind, I begun sketching little thumbnails of this big cat in the amazon. I sketched the final few concepts just moments before choosing a wall and starting to paint. If I hadn’t done any of these thumbnails, I would have to go with a very rough idea in my mind, and develop it as I painted. That combined with being a beginner level with spray paints might not have led to the strong finish I had. In fact, I don’t think I would have come close in the short time available as I would have been spending so much more time thinking about exactly what I was painting next. The thumbnails allowed me to dive straight into the painting with much more confidence, and allow me to focus more on other areas such as colour choices. In the end I was really happy with the painting I produced in the 12 hours I had to paint it. And the experience served as a personal reminder of the importance of sketching out these thumbnails before developing and working on a larger piece. I think as a bare minimum, thumbnail sketches are essential for the artist, just like having a map or compass is when you go out on a long hike or trek into the wild on a solo adventure. If you want to arrive at your destination on time and enjoy the process, prepare just a little first, and be ready before you start. The process doesn’t take much effort, and actually be a really fun experience. This was me painting on the first day. This is the result of my biggest piece of art, and first exterior public mural. The size is approx. 4 X 3.5 meters. It was both exciting and difficult painting it. I did my best and gave it all my focus until the very end, when I decided to stop because it was getting dark just after 6pm. Now I want to paint more murals as I travel the rest of Brazil, and South/Central America. Master Studies As A Practice For Amateur And Professional Artists. Master studies are recommended by many top, professional artists around the world, as being an excellent way to practice, develop and study the greats of the past who dedicated their lives towards excelling in their chosen craft. Master studies are usually paintings or drawings that are copied to the best of the ability of the student, who must be conscious and aware of why and how the original piece was created, the technique, what made it great, and the thinking methods of the artist who created it. It is advised that the student set a specific goal as to what they hope to achieve from the study, for example the focus could be on composition, colour, lighting, or the unique painting style of the master. The artist should be fully present when doing the study, and making sure he/she can pause and question why the master chose to take the actions that led to the finished piece, instead of working on autopilot and mindlessly copying just to copy. I found a good article on some thoughts about Master Studies by the well known, excellent artist Ron Lemon, posted on the Muddy Colors blog here. I have personally practiced copying works from the masters in pencils, pens and digital paintings of traditional oil paintings. But this time, I chose to study the brilliantly sculpted statues in the louvre museum, and I drew them in pencil on paper, focusing on the light, values and forms of each one. I selected 10 of the marble sculpture statues from the Louvre Museum in Paris to study from. I found it a valuable exercise even after just 10 days. I wanted to keep them going, but had to settle for 10 as I had a limited number of good quality reference photos to work from, and I was running out of time to prepare myself for my next big travel adventure to South America. In the end I completed 10 of the studies, and framed the final two in my hometown Brighton, England, before leaving to make my way to London. I returned home to Brighton, England and rediscovered some of my photos from my second trip to the Louvre museum in Paris... This is the first drawing of mine that I made looking at my own photo reference of one of the marble sculpture statues which I came across when exploring the European section of the Louvre. This was my second drawing looking at my own photo reference of one of the marble sculpture statues inside the European section of the Louvre Museum in Paris. I didn’t quite manage to finish this one in time. But here it is, another Louvre Museum marble sculpture drawing for daily drawing practice! I don’t think I chose the best photo reference out of my photos for this pencil/value study, the lighting on the sculpture didn’t really reveal much contrast on the form, as only a fraction of direct spotlight was hitting it. But I chose to study this particular sculpture more for the pose/foreshortening/emotion/expression which really stood out from the rest. I was also listening to one of Jordan Peterson’s most recent interviews, and in it he was talking about the psychological persona and shadow, the hero’s journey, life being a struggle and tragic... this particular sculpture I thought resonated quite well with what he was talking about, maybe that’s partly why I chose to draw it. I’m actually really enjoying this practice, and I can see that if I keep pushing I can probably improve my form and lighting on the figure quite a bit. Isaac Newton? Napoleon? I'm sure who this is as I forgot to take a photo of the description. This was the first drawing that I decided I wanted to frame. Somebody asked me if it was Nostradamus, or Plato? 'Neptune Calming The Waves' - Lambert-Sigisbert Adam, Louvre Museum, Paris. This was my final pencil drawing in Brighton (for now) completing 10 days of pencil drawing studies from the Louvre museum’s marble sculptures. I framed this drawing along with Day 9, and all of the drawings are for sale! As I mentioned above, I framed my drawings day 9 and 10 before I left Brighton, England, and took photos of them outside my house. These drawings are for sale, and can be shipped anywhere around the world from England. If you are interested, just comment below and I'll get back to you! For any artists reading this post, how was your experience practicing master studies? Which medium(s) have you used, and did you find that it improved your work and increase your skill level? Do you do master studies often? Portrait Of My Scottish Photographer Friend. This is my first screen recording that I have made of me painting digitally in Adobe Photoshop. It is sped up 40X so you can quickly see how I go about my digital portraits, and the painting process. I used just one brush, and only colour picked from my own colour selection and combinations on the painting itself, similar to how I would pick up paint from a real colour palette. Along with Photoshop, I am painting with a Wacom Intuos 3 stylus tablet. I drew/painted his portrait digitally from scratch, the same with all my work, just as I would by drawing/painting digitally. I mention this as a mutual friend asked me if I created the art from the beginning and built it up. Which I did and always do. You can see how my proportions and accuracy of the tilt/angle of his face is a bit off the mark. I will work on improving this so I can get even more likeness of Greg in the finished painting. Greg has been a good friend of mine for just over 8 years. We I met in Auckland, New Zealand, started working together in the same bar, played football together in the park, and ended up living together before I left to travel the country. Greg lives in the stunning Sterling region of Scotland, in a beautiful place called Loch Lomond. I am currently exploring the Scottish highlands with him. Lots of epic photos will be on the way! Greg is also an excellent professional photographer @napierphotography_official. The music for this video is a segment from the d&b 'Spring Mix' by Technimatic which was made available as a free download by the artist. I will be finishing this digital portrait when I return to England next week. Would you like to see how it turns out? After living in Queenstown, New Zealand, The Gold Coast, Australia, and travelling around Asia and the Pacific Islands, finally it was time to return home to the place I was raised up, and see friends and family, old and new. 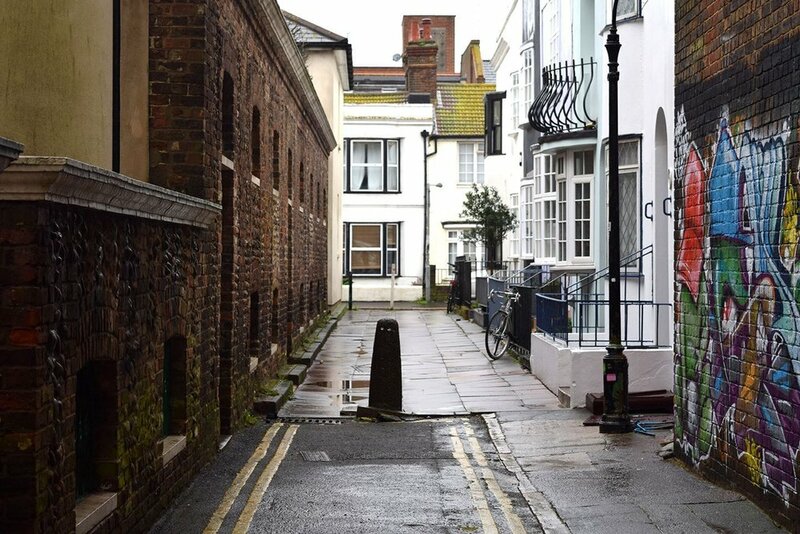 Above image; 'The Back Alley' - I opted to choose a photograph of a Brighton street, my back alley in fact, to show a glimpse of the real Brighton streets up close, instead of something much more commonly associated with the City and widely recognised. Why? Because this is where I grew up, and walking back here is like stepping through time. It is significant to me and this post. Brighton, once a small fishing town, now a lively 'City' (It still seems like a big town to me) on the South East Coast of England, is my hometown. 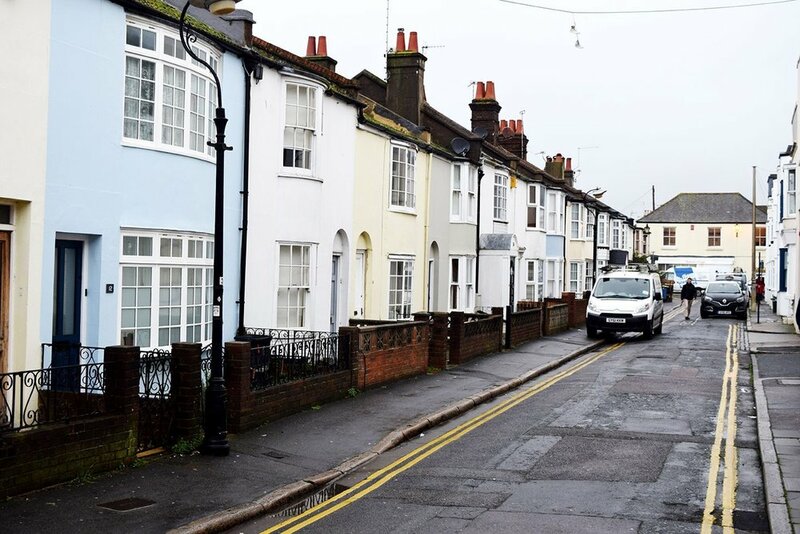 I moved to Brighton when I was 3 years old, having left London due to some unfortunate circumstances, with my mum having to leave her now very valuable house behind in Stretham, London. I spent a few years living in a couple of places in Brighton & Hove, before moving to Cheltenham Place in 1996. This is where I spent most of my years before going to Preston, Lancashire to study at University, and then to begin world travel July 2009. I got off the train at Brighton Station. The sights, sounds, and smells, narrow streets, tiny shops, and southern English accents brought back many fond memories of my childhood and teenage years instantly. It was a strange feeling, after 4 years away from home, living in big open spaces, surrounded by epic mountains, lush forests and crystal clear lakes when I was staying in Queenstown, NZ, and right by the warm, sandy beach and clear ocean which I would swim in almost daily in Broadbeach, Gold Coast, Australia. There was an expected sense of nostalgia as my mind ran through many memories of the past, flashing by rapidly in my mind. It was the first time that I've had this kind of experience upon returning home before. My previous longest trip away, was when I returned to Brighton December 2011 from India and Nepal, after spending 2.5 years away travelling. There was strong reminiscence of the past back then, but definitely not to this degree. My cousin Jack greeted me outside the entrance of the station, he asked me what it was like, my first few words to him was "This feels really strange". And it wasn't just this unusual experience of feeling like I was stepping back in time which gripped me, as on this return things seemed more different then any of my big trips away before. I felt I had changed more as an individual. I was different. I had seen, experienced, learned and grown so much in these 4 years. Was this having an effect on how I perceived my return home? Above image; Walking out of Brighton station onto North Road. Above image; Tunnel beneath Brighton station, home of the iconic Brighton toy museum. Above image; Side of the Prince Albert pub. As you walk down the underground tunnel from Brighton station, you can enter the Brighton Toy & Model Museum, and then you are greeted by the Prince Albert pub, which is now decorated in mural art, and a famous Banksy piece of street art. 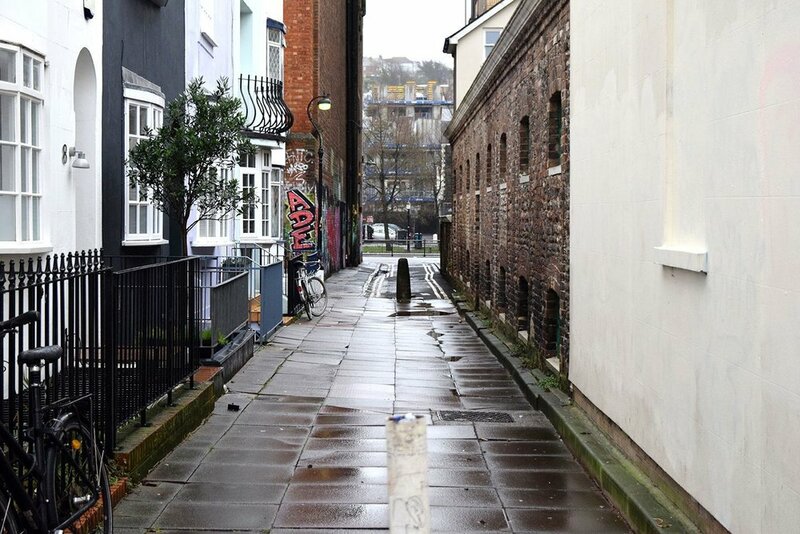 The famous street artist Banksy's Brighton piece, just around the corner from the top of Trafalgar stret was auctioned off to a buyer in Miami, U.S for £345,000. The piece remains on the side of the Prince Albert pub, 'protected' in a street frame of wood and plastic. This piece by Banksy has been here for years. It inspired me to go on a Banksy street art hunt in New York, U.S.A late 2013, trying to locate and photograph all of his 'hidden pieces'. Mural art now covers not only pub walls in Brighton and streets and alleyways around the city, but also shops, flats and houses. I'm sure the old graffiti art Rare Kind Gallery, (now a record shop) which was originally positioned at the end of my street on Cheltenham Place when it first opened years ago, now occupied by 'The Fountain Head' pub (named after Ayn Rand's classic? ), had an influence on the budding graffiti and street art scene here. I've always wanted to work at Rare Kind, I wonder what they might think of my art work if I showed them my development today? I'd have to locate where they are today first and make sure they are still up and running. Above image; Original U.K street artist dedication. Above image; Mural Art on a shop on Kensington Street. Above image; Tropical/rainforest street art close to my house. 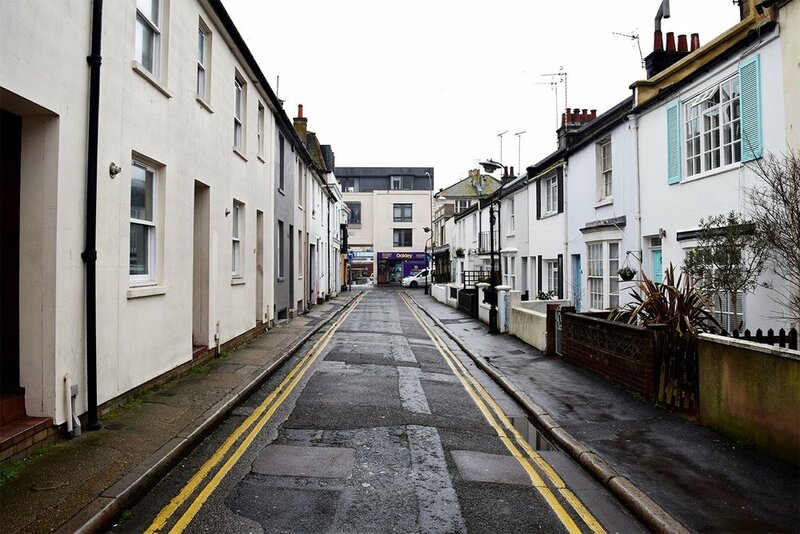 My street, Cheltenham Place, is considered prime location in Brighton. You walk out of my house, and to the right you have 'The Basket Makers Arms' and 'The Eagle' pubs at one end, and to the left you have 'The Fountain Head' pub, formerly the first graffiti gallery in Europe, 'Rarekind'. Above image; Gloucester Passage, home of 'The Eagle' pub, one of 3 on the end of my street, Cheltenham Place. Above image; The Eagle pub, leading into a Graphic Design agency. 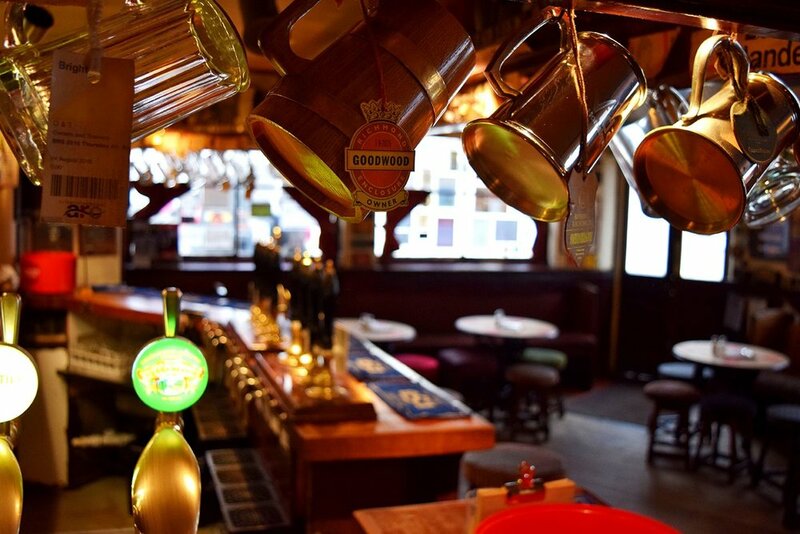 Brighton is now home to about 900 pubs. That's a lot for a small city! As I previously mentioned, 3 are positioned at either end of my street. If you aren't already aware, pubs are an important part of life and culture all around England and the rest of the U.K. The word 'pub' being an abbreviation for 'Public House', where traditionally people would sometimes open up their homes for the public to sit in and socialise. Unlike American bars, in a British pub you go to the bar and order a drink yourself instead of table service. If you are with a group, it is common courtesy to offer/get your friends a drink (a round) as you go to the bar, and bring them all back to the table yourself. Your friends/group usually take turns to do this. 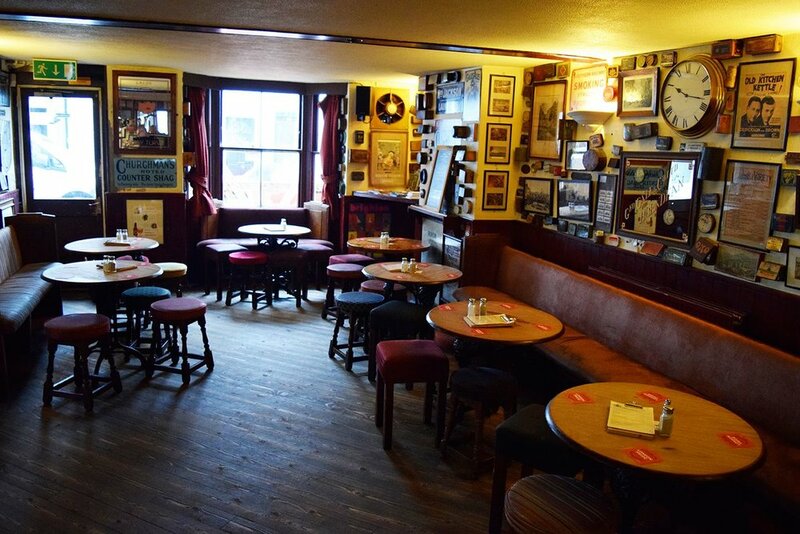 Traditional pubs in England have always been a place for locals and travellers to gather and talk about the current times, the weather (of course, we're British), and quietly discuss 'conspiracy theories', such as the 'accidental death' (unlawful killing) of Princess Diana. Maybe not amongst the proud royalists mind you! Pubs are a place to relax, unwind, and speak your mind. And it is not an obligation to get 'pissed' on alcohol, despite the binge drinking culture here. You can just as well order water, a juice or soft drink if you prefer. The Basketmakers Arms pub has been around longer than the other two pubs at the ends of my street. Quite a bit older in fact, since the 19th century! This particular pub is a favourite of the locals. It's cozy, warm, and decorated with traditional local, national and cultural memorabilia. Above image; The entrance to 'The Basket Makers Arms' pub at one end of my street. Take note! Only small vehicles can pass down my street. Above image; The street side view entrance of The Basketmakers Arms. The Basketmakers Arms has been around since the 19th century. The inside is full of English history, especially related to alcohol, brewery's, Brighton and old advertisements. Above image; The view of the interior as you walk through the main entrance of The Basketmakers Arms. 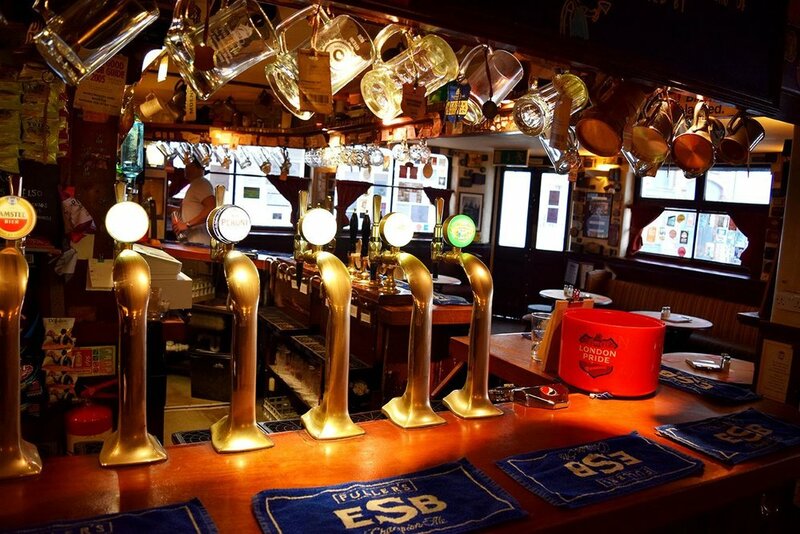 Above image; The far side of the bar view, with pub owner Blue who has co-owned the pub for 25 years. Above image; The side street entrance to the pub. Above image; Old cans, tins, containers, photos, posters decorate the walls. Above image; View from the back of the pub, looking at the side entrance. Above image; Close up view of the bar,. The smell of fresh polish for the brass taps filled the air as I took this photo. Above image; Old, traditional beer glasses. My house was once a brewery from 1850's until 1914, originally called 'Ashby & Co Malthouses, Smithson's Brewery', later ' 'The Bedford Brewery'. Funny that, considering the amount of drunks and alcoholics who have passed through my house, and have pretty much claimed 'sanctuary' over the years, always turning up at my house as a safe and comfortable place to have a drink, as 'friends of the family' (mostly my mum). They all seemed to be unusually drawn to my house like a magnet. I always thought it was my mum's charismatic open nature and warm personality, but maybe there was something else energetic about the place which attracted these types like moths to a flame? Lovely people though despite being seriously annoying on multiple occasions when raving drunk after midnight, well, most of them. Ha! The street itself is typical of all those in the North Laines, narrow, uneven, lively, one way access, and surrounded by old traditional 'cottage' buildings and homes. Above image; View of Cheltenham Place to the right of my house (as you exit). Above image; View of Cheltenham Place to the left of my house towards The Fountain Head. Above image; View of the back alleyway, around the side of my house. Above image; View of the opposite end of the alleyway. Above image; Close-up, looks a bit eerie don't you think? Above image; Shoes over an electric cable on my street. Somebody marking their territory? Above image; And the new wolf who watches over Cheltenham Place. So that's it, I hope you enjoyed my post covering my return home, some insight into Brighton street/pub life and culture, where I live, and a little bit of history. I'll probably make another post on Brighton in the not so distant future, covering more of the iconic tourist sites, and of course, the famous Brighton beach! Thank you all for taking the time to read and appreciate my post! The final collection of my best drawings from last year. A combination of fantasy Illustration, story, emotional, stirring and soulful pieces, along with plain and simple creative fun, drawing/illustrative practice. Continuing on from my previous posts; My Best Artwork Of 2017, and; My Best Pencil & Ink Drawings. This is my final set of my best drawings from 2017, ending My Best Of for last year. This was one of the ink illustrations I created for the Inktober challenge, October 2017. I was following the official prompt list for the challenge, and for this particular day, the prompt name was 'Snake'. This one took me about 7 hours to complete. I first sketched in the rough outline of the woman in pencil, and later I used a combination of ink and brushes, along with Japanese brush pens for finer details. This was the start of an exercise of sketching 100 heads for practice, and as an art warm-up for when I wake up in the mornings. Are you going after your goals and taking action? One of my pencil drawings for the '100 Heads'. 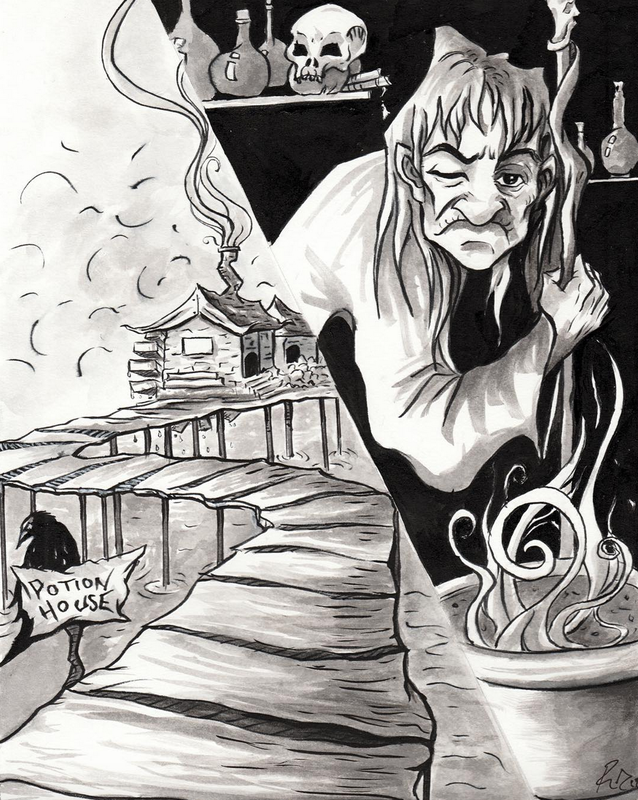 This was another one of my original ink illustrations created for the Inktober challenge with the prompt name 'Long'. 'The clouds were long and thin, but almost transparent, as the world did not require much rain. A misty water like vapour enclosed the planet, allowing vital nutrients to fall onto the Earth's lush green landscape. All beings were nourished from the water, sun and the fruits. I think it's fair to say that most people when asked how they are, usually give an automatic response which does not honestly reflect how the individual feels at the given time. But often the other non-verbal forms of communication reveal something that doesn't match the words. So why do people not truly express how they feel in the moment? Why is it that people can insist on presenting only an unchanging, 'happy' and smiling persona to the world, when it is natural for us to feel a full range of emotions within any amount of time, at any given time, and when it is also healthy to sit with each emotion, to experience, contemplate on and express in our lives, rather than repress, bottle up and ignore? Many people talk about anger as a negative emotion, an emotion that is wrong, and which should also be ignored, repressed, and never expressed. Of course the build up and eruption of the impulsive, destructive and infantile side of anger can cause many regrettable circumstances and situations to arise. But what are the consequences of ignoring a normal, natural emotion in the first place, which is meant to be felt by us, and which manifests for a reason? ***By acknowledging, accepting, and being with the emotion when it initially arises, surely we can then begin to understand why it came, and learn to use it in a non-destructive way, and transmute it into a force for direct and deliberate, useful, productive or justifiable action. Michael Tsarion describes the difference between the 'Red Flame', and the 'Blue Flame' of anger here. This was another one of my ink illustrations for the Inktober challenge. This one was part of a mini-series within the challenge, by me which started to illustrate the story of my own 'warrior'. For a couple of months I began attending some life drawing classes on the Gold Coast. This was one of my life drawing sketches, focusing on drawing 'force', finding the gesture and emotion of the model. This was another one of my pencil drawings on paper. This was one of my December pencil drawings. This was another of my ink drawings for the Inktober challenge in 2017. I'm a world travelling artist from the U.K, previously living in Australia, now in Scotland, but soon to begin another big trip to South & Central America. I will be posting about the places I have been with my own photography along with video content, and I will also be posting my art, and art process as I travel, pause and get creative! Thank you for checking out my 'Best Pencil & Ink Drawings of 2017 - PART 2' post! I did have to work a lot during the Xmas holidays and new years, which left me with little time to pause and contemplate 2017 properly. 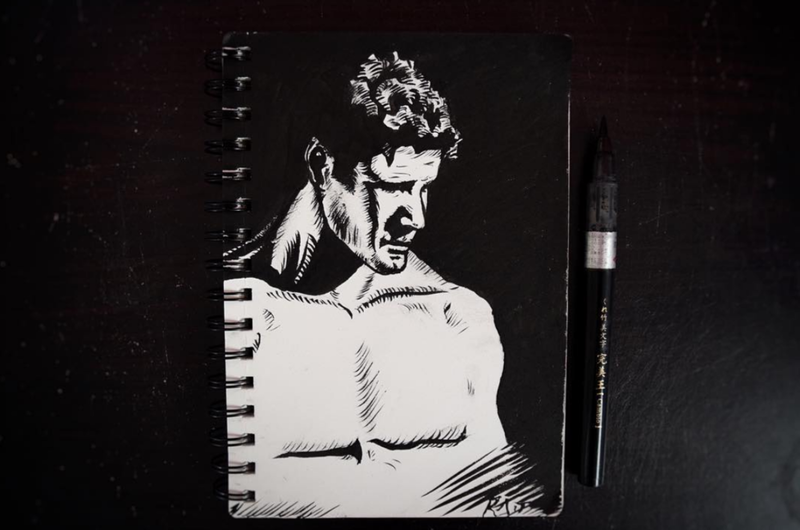 In this post I am going to show you some of my best drawings in both pencil and Ink. Some are really quick sketches taking only a few minutes, others are much more detailed which took me 5+ hours to complete. I absolutely love sketching in pencils, and drawing in both pencils and with ink pens. With pencils I really enjoy being able to draw thin and thick lines whilst holding the pencil and twisting my wrist in different directions, and also drawing soft lines with the slightest contact on the page which becomes harder with more applied pressure. With inks I love the strong, bold effect they give off as the black contrasts with the white of the paper much more, making the artwork appear to jump off the page, and this really grabs the attention of the viewer. Overall the use and feel of pencils and inks on paper, and the way I can hold pencil/pen at various angles, creating a wide range of marks, keeps bringing me back to these drawing mediums, and offers more freedom from their use when compared to drawing and sketching digitally with a stylus and tablet. So this post is also dedicated to my traditional drawings only! Above image; 'Unseen Battle' 👊 - This was one of my 2017 pencil drawings on paper. 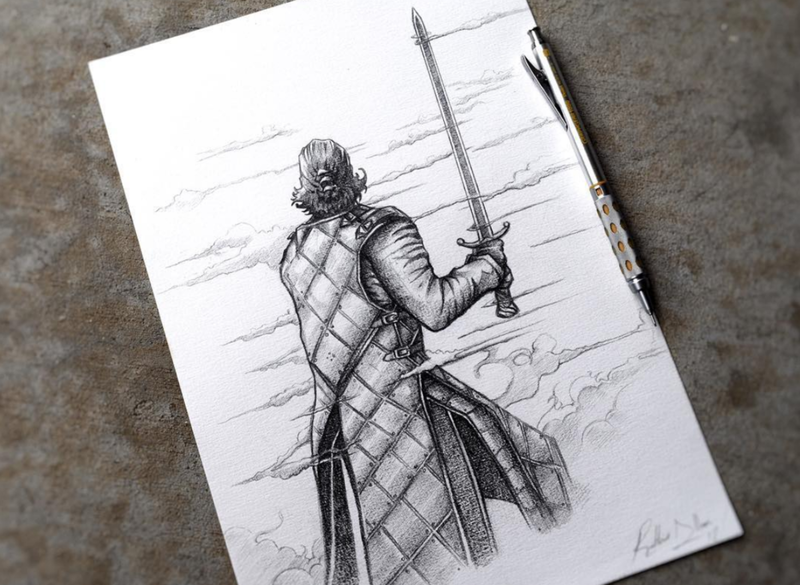 I used a reference shot of character John Snow from The Game of Thrones. Above image; 'Solution Thinking' - 'Hmm, how can I improve my situation for the better?... 💭 This was one of my Ink drawings for the Inktober challenge. Above image; 'Divided' 🍃🐒 🍌⚡️- Another one of my ink illustrations for the inktober challenge. I experimented with ink washes for this one. It was my second attempt at using ink and a brush instead of a brush pen. Are you waking up on a Monday morning feeling dread, or excitement? For so many, the realisation that Monday has arrived so suddenly, can be devastatingly depressing. And you might walk into that office or whatever place you go to with an expression like this on your face. But, if you are taking steps towards your true desired path, Monday is another great opportunity to roll up your sleeves and put in productive work towards improving your skills and self development. If you're not there yet, you can take incremental steps. You can start planning just 1 hour (or 10 minutes if you are honestly that tight for time) to work on doing that thing you love to do most, and move on from there. If you don't know what you love to do yet, you can schedule time to discover what you like by trying new things. Above image; 'Underwater' 💧🐋 'The Four Mermen & The Quartz Crystal' - Atlantis 🐠 - This was another one of my Inktober ink illustrations on paper. "What an astonishing thing a book is. It's a flat object made from a tree with flexible parts on which are imprinted lots of funny dark squiggles. But one glance at it and you're inside the mind of another person, maybe somebody dead for thousands of years. Across the millennia, an author is speaking clearly and silently inside your head, directly to you. Writing is perhaps the greatest of human inventions, binding together people who never knew each other, citizens of distant epochs. Books break the shackles of time. A book is proof that humans are capable of working magic." ― Carl Sagan, Cosmos. Above image; 'Waiting For The Bus'🚍🚎 - Thumbnail Urban sketching on the Broadbeach South Tram/Bus Station in the Gold Coast Australia. I only had a few seconds to capture something of these people as they say waiting for the tram. And now whenever I look at this drawing of mine, I am reminded of that very moment which I can remember in vivid detail. The benefits of carrying a sketchbook wherever you go allow for great opportunities to draw from life in a number of situations. Even if for only a few seconds. It is conscious practice, and you record that moment in time visually forever. Above image; 'The Warrior, The Horse & The Sword.' 🌌💫 - This is one of my personal favourite ink illustrations I created for the Inktober challenge in 2017. I started to create a story with my warrior, one which I will no doubt continue. Thank you for checking out my 'Best Pencil & Ink Drawings of 2017' post! Above image; My 'Essentials of Realism' Digital colour portrait. This was one of my final online assessments where I had to paint a realistic portrait from the reference provided (the teacher's daughter). This took me 60+ hours, but I was very happy with the result at the end, and surprised myself. Personally I'm really excited about 2018, how about you? I've learned more about who I am as an individual by taking a new personality assessment (which I will post about soon), I completed my first colour wall mural, painting a mermaid on the walls of a bar/restaurant in Palm Beach, Gold Coast Australia, and much more! 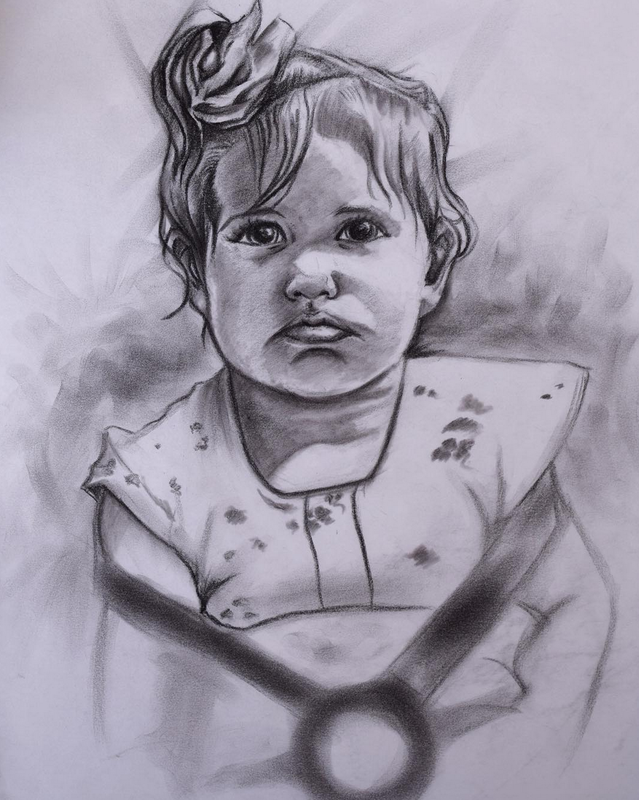 Above image; 'Penelope' Charcoal drawing of my 1 year old niece in England. Above image; This is my portrait of my friend, Christelle Langlet, painted digitally. Above image; 'Call of The Wolf' - My pencil drawing on paper. Above image; 'The Moon's Rapture' - Frank Frazetta Study. My digital painting copy from the master fantasy artist himself! Above image; 'Call of The Hawk' My ink illustration/drawing on paper for the Inktober challenge. Above image; 'Lost Landscape' - A digital illustration by me of a fantasy scene, a lost landscape. Above image; 'One With The Force' - This is my digital painting realism value study. This is a digital painting study I just finished of the shaolin monk like martial artist character Chirrut Îmwe from the Star Wars film ‘Rogue One’. Above image; This is my mermaid wall mural I painted in a bar/restaurant on the Gold Coast, Australia. I will make a more detailed blog post about this piece soon! Above image; 'Ancestor Of The Land' This is my latest portrait study of an Australian Aboriginal man. 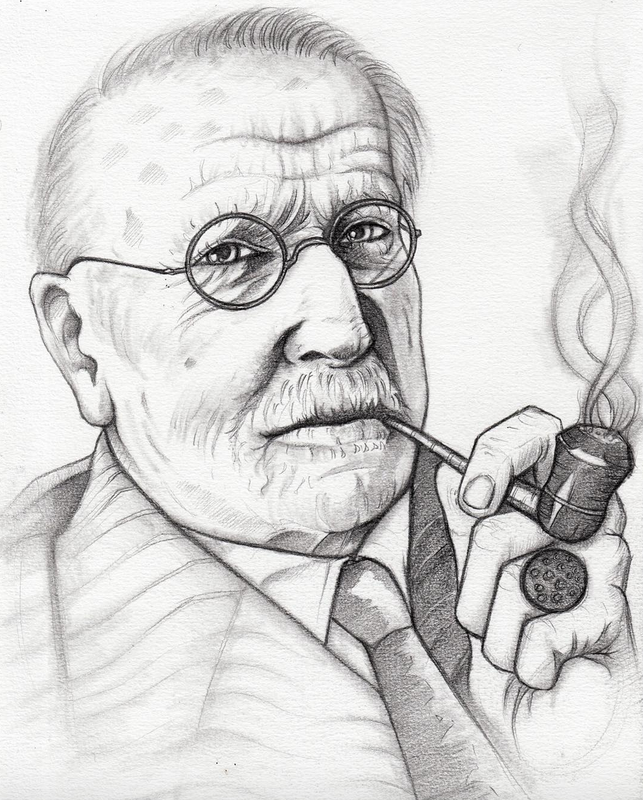 Above image; My pencil drawing of psychologist Carl Jung. Above image; 'Isle of mystery' My fantasy digital art illustration. Above image; 'Something's Ahead' My digital portrait study. Above image; 'Just Wondering' My pencil sketch on paper. My pencil drawing on paper. I think this is my best work of 2017. I'm really looking forward to getting better as an artist, writer, blogger and much more in 2018. Thank you for reading, commenting, liking, and all the best for you in 2018! This is a photo I took looking at the active volcano Sakurajima, in the Sengan-en gardens, Kagoshima, Kyushu, southern Japan. Last year I visited Japan for the 3rd time. Once again I was amazed and impressed by the incredible level of hospitality, kindness and friendliness of the Japanese people, and I was left in even more in awe of the stunning countryside and landscape. After re-visiting some of North Honshu once again, the major cities Tokyo, Osaka and Kyoto along with a few other places, I had a choice to make. Should I travel to the North in Hokkaido, or travel to the South in Kyushu? This time I chose to travel to the South. After a very early train at sunrise leaving Nagasaki, south western Honshu, I arrived in Kagoshima. Kagoshima stain glass window art. After getting off the Shinkansen bullet train, you are greeted with this highly detailed work of art. A stain glass window depicting the active volcano Sakurajima in Kagoshima. And then as you walk into the entrance of the train station and look to your right, on display are these delicate looking Japanese royalty dolls. Some of them had interesting expressions on their faces. A few more of these traditional dolls were on display. These funny little anime character key rings were also on display at the entrance of the train station. It wasn't long before I boarded a ferry from mainland Kagoshima to climb and explore the active volcanic island Sakurajima. People actually live on this island! I took this photo on the ferry. On Sakurajima. This was my first stop from the tour bus with a view of the volcano. On the second bus stop, I came across this very unusual giant rock sculpture of a giant breaking out of the ground, appearing to be screaming whilst clutching onto a guitar. Was there once giants in Japan? And on the final stop was the highest point we could reach. Sakurajima 373m above sea level! This is me with the rock every single tour group was lining up to get a photo with. And this is my close-up photo of Sakurajima on the way down the volcano back to the base level and ferry port. Can you imagine how intense this would look during an eruption? After getting the ferry back to the mainland and having lunch, it was time to go and visit the traditional Japanese gardens. This is a photo I took in the traditional Japanese gardens of Sengan-en in Kagoshima. The Cherry Blossoms were just beginning to make an appearance. There are always fine examples of beautiful and intricate craftsmanship and design to be found in Japan. The attention-to-detail in the smallest things are visible for all to witness, that is of course if the the individual is alert and presently aware of their surroundings instead of being transfixed on digital devices. This particular site I wished I had more time to spend in. 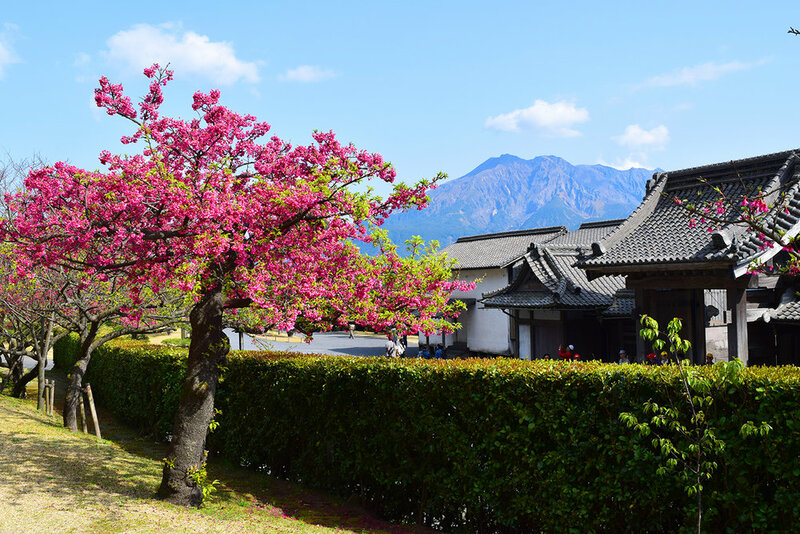 If you visit Sengan-en in Kagoshima, allow yourself at least a couple of hours to slowly explore and absorb this inspiring setting. There is a lot to appreciate here and some great photo opportunities around every corner. So go slowly and allow yourself to experience it all and really take it in. One with the bamboo forest! The traditional Japanese gardens in Sengan-en also has a small but beautiful and peaceful bamboo forest. This bamboo forest you can't really get lost in, unlike the main one open to tourists in Kyoto. And when I arrived here, there was nobody else around apart from me and my friend. You could hear the wind blowing through the leaves, the sounds of birds and running water from the stream. I decided to take a seat among the bamboo and close my eyes for a minute. Running water. Of course I had to try out a macro shot in this place! And as you would expect in a Japanese Zen natural garden, the sounds you hear are serene, water is flowing, there is a sense of calm. After soaking up all of the refreshing and stimulating sites in the traditional gardens, I felt energised and ready to try a flying Hadouken with the active volcano Kagoshima in the background. This was a really fun way to end the day here. I thoroughly enjoyed it and I would say it is definitely a place in Japan well worth visiting! 'Jaguar' - The Process of My Best Oil Painting So Far. - This is my finished 'Jaguar' Oil Painting which is my first animal portrait, and my best oil painting so far. Next I'll show you the steps I took to reach this point. In 2016 when I was living in Queenstown, New Zealand, I began to experiment a little bit more with oil painting. I first discovered an Art Gallery/Studio in the Center of Queenstown, after sitting on a bench, under a tree in the Queenstown Gardens. I was reading a book, pausing, reflecting and sometimes daydreaming, and then responding to a sudden thought, flash of inspiration, or intuition, which brought the word “gallery” very clearly to my mind. When this happened I felt that I should act straight away. So I got up, picked up my bag and decided to go and visit the local galleries. I walked into the closest gallery, looked around, and didn’t feel any real reason why I should be there. So I moved on and went on to another gallery a couple of streets away. I walked in, spoke to the receptionist, and then a senior artist/teacher called Marion. I introduced myself as an artist who had recently arrived in town, and within a minute or two, I was discussing borrowing/renting out a shared space there (at the time there wasn’t anything available). Within a couple of weeks, I started to rent a desk/small area in this shared studio space in the Arts Center for the first time. I started off drawing and then learning to paint landscapes, and thanks to the help and advice from Artist Samuel Earp, I was quickly discovering how to mix the oil paints together to create specific colours and tones. I combined both studio and en plein air (painting outside) practice during the 7 months I spent living there and sharing a studio room with Sam, and also going with him to paint the surrounding lakes and mountains. The plein air painting was very challenging at first, but the incredible views of nature that surrounded me, along with watching the great work being created by Sam, inspired me to keep practicing with this medium. After some months experimenting with landscapes, I decided to try an animal portrait. I have always enjoyed drawing animals in the past. I guessed it would be a good idea to experiment with an animal portrait before a human one. So I decided to go for the 'Wild Cat', or 'Big Cat' family, and I chose a black Jaguar, as this animal had previously appeared in a few of my dreams some years ago. Either that or I am mistaking the Jaguar for a black Leopard. It wasn't easy to remember the exact details in my dreams and distinguish the difference between them, so I settled for the majestic and mysterious black Jaguar. I started off with covering my originally white canvas with a paint layer of burnt sienna, as advised by my artist friend Sam, to help add a level of vibrancy which would come through the painting. This technique also helps to reduce or eliminate any level of fear or apprehension the artist might have when faced with the glaring white canvas before making their first few marks! After the first layer was dry, I then created a darker burnt sienna mixture, and sketched in my Jaguar with a body shot against a tropical South American jungle/rainforest background with a flat brush. I liked how this initial step looked, however, something didn't seem right, I felt like I wanted to show more up close detail which I wouldn't have been able to achieve with this pose. I decided to change my idea early on, and go for a head shot portrait of the Jaguar instead. I found a beautiful photo of a black Jaguar by a Deviant Art Photographer called 'Xandau', and I decided to use this as reference. I have never seen a black Jaguar in real life, especially in the wild (yet? ), only online on video, and in my dreams. I scraped my original Jaguar off the canvas, and took on the challenge of portraying this incredible animal as well as I could on canvas from a new point of view. This was my first step of my new painting. I sketched in the head and background leaves with a darker mixture, and once it was dry, I mixed the rainforest greens, and painted them in first. From this photo you can also see my first rented studio space! At the same time, I was living in a tiny cupboard under the stairs, as people would say “Harry Potter style” in a shared house in Fern Hill, so I could also afford to rent this space and keep costs down. Maybe one day this part of my story will prove to be a funny and important part of my artistic journey, and I will repeat it many times with a smile on my face! My second step, completing the background rainforest leaves in simply, so that the detail and hard edges of the Jaguar would come forward more. My third step was painting the fur of the Jaguar using a combination of Prussian Blue, Ultramarine Blue, Raw Umber, and Burnt Sienna. I 'blocked in' the larger shapes and forms first before any level of detailing, leaving the eye as focal point, until the end. My fourth step I continued painting in the fur, and filled in the main colour shapes of the Jaguars eyes. I took many hours working up the layers, and experimenting with blending in the fur. I made sure to aim to keep a fine balance of both hard and soft edges throughout the process. Jaguar - Finished Oil Painting. And finally after many days and nights of persistent practice, deep focus, hard work and effort, I arrived at this finished painting. I was very happy with the result and initially I did want to try to sell it. But I decided to give it away as a gift to the Brazilian family who had been supporting my artwork on social media every time I posted. I packaged an oil painting for the first time, and sent it to Brazil. It now hangs on the wall of a warm, loving family house in Porto Alegre, Brazil. This was a quick sketch of a man and woman I created on the Broadbeach South bus stop/tram station whilst I was waiting for the bus. They are thumbnail in size, as you can see the scale of them compared to my brush pen, and both sketches were of the real people I was looking at, at the time. This was a reminder and note to myself of the benefits of carrying a sketchbook wherever you go allow for great opportunities to draw from life in a number of situations. Even if you can sketch for only a few seconds, it is conscious practice, and you record that moment in time visually forever. So from now on, I’ll do my best to keep a sketchbook on me more often, so I can record more of these moments which would usually get lost somewhere in memory.